The Zebex PDL-20 has been discontinued. No direct replacement is available. The PDL-20 is part the next-generation of PDTs. 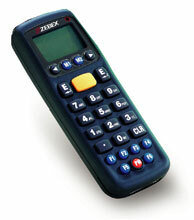 The PDL-20 provides quick and precise data management in the size of a cell phone. PDL-20, -10 Portable Data Terminal KIT, 2048K, Includes Battery, Tab, Clip, Power supply, PC Based TaskGen. Cradle not included.